Thomas Goetz is a science writer and health-care innovator. The cofounder of Iodine, a health technology company, he has served as entrepreneur in residence at the Robert Wood Johnson Foundation and executive editor at WIRED. His writing has been selected repeatedly for the Best American Science Writing and Best Technology Writing anthologies. He lives in San Francisco. "Immensely pleasurable... a superb narrative... [Goetz is] a fluid and elegant writer, with a knack for painting the personalities of those involved." “The Remedy is a highly entertaining, interesting, and thought-provoking book, leaving the reader with a much deeper appreciation of how much safer — and in many ways, predictable — our lives are today thanks to the toil and efforts of men such as Robert Koch and his contemporaries." "An intriguing medical and literary history… fascinating, convergent stories [of] doggedly inquisitive men who discovered that neither germs nor crime are any match for science." "The Remedy is a rare, thrilling achievement: a book that helps us understand the roots of transformative ideas that simultaneously manages to tell a story worthy of a 19th-century novel, full of surprising links, rivalries, and intellectual triumph." 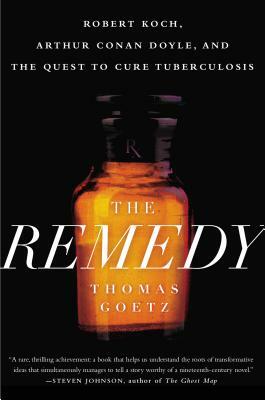 "In The Remedy, Thomas Goetz offers a wonderfully original origins story for modern science. He weaves together one of the great achievements of the nineteenth century--the germ theory of disease--with the creation of the fictional superhero of science, Sherlock Homes, with grace and surprise." "A thoughtful, patient, ultimately fascinating account of the struggle of 19th century science, and society, to come to grips with the germ theory of illness, and develop new technologies to take on one of humanity’s oldest scourges, tuberculosis." "A gripping story... with great verve, painting word pictures full of color and telling detail... vividly evokes the rivalries rife in the scientific world." "Weaves the suspense of a Sherlock Holmes mystery into a tale of ambition, obsession, scientific discovery and skepticism at the dawn of modern medicine." "A beguiling real-life medical detective story."